Revolution Slider Error: Slider with alias stellar not found. Should you be staying in Cape Town and are not driving to Gansbaai your shuttle will collect you from your hotel early in the morning. After an approximate 2 and a half hour drive you will arrive in Gansbaai at the shark diving crew house. Breakfast will be served at the crew house before the tour brief and launch. During the winter months (May – August) the boats will take a 15 minute ride out to Shark Alley and in summer months (September – April) will ride across the bay and anchor 500 meters off the beach where the sharks tend to move around. Once anchored the crew will immediately start to chum the water with fish based products such as like tuna and fish oil to attract the sharks. With the chum in the water all we can do now is wait for the first shark to arrive and hopefully this happens quickly. Once the first shark is in sight the cage will be lowered into the water and divers kit up for the cage diving. Hopefully the sharks will stay around the boat for a while and everyone will see the sharks up close and personal. For those who don’t want to cage dive then viewing the sharks from the boat is exceptional and sometimes even better than in the cage. After this amazing experience we will pass through the famous Shark Alley (In Winter) where a colony of 60, 000 seals can be seen at Geyser Rock. Back at the crew house we will watch the video footage of the day and enjoy tea or coffee. 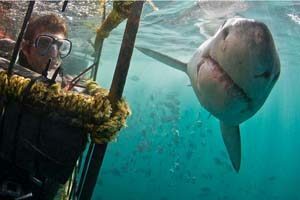 We have been in the industry since the beginning of commercial Shark Cage Diving. We have been working in the industry since there were only 3 boats out there taking just a handful of clients. We have grown with the industry and still have the same passion for the sharks as we did 15 years ago. We are flexible with your booking and should the boat cancel that you are booked on for any reason we will move you to another boat. Should the trips in Gansbaai be cancelled we will try to get you out at our other 2 destinations False Bay or Mossel Bay. We are in contact with all of the boats in all destinations and keep a good eye on the weather. We will not just cancel you and not give you an option but will do our best to get you out for your once in a lifetime experience! Should you not see a Great White Shark on your trip you will be given a voucher to go again for free! Fortunately we only get maximum 2-3 days a year when we do not see a Great White shark on a trip but please plan 1-2 days after your booked trip to go again for another day go should you be unlucky on the day. We have 2 Offices. One is in Kleinbaai harbour overlooking all of the boats and the other is our main booking office in Gansbaai. We monitor all the boats daily and know when they launch and return as well as how many sharks they are seeing and the conditions at sea. We are in the know about who is doing what, and where and have the general knowledge to give you a trip to match your expectations. Should the boat you are booked on cancel due to the weather, mechanical or other issues then we will make sure we get you on another boat even at late notice. You can also call us if you have been let down by someone else and are desperate to go out as we are in contact with all of the boats. We will never cancel your trip without giving you all of the options and the best possible chance to get out to sea. Should the weather not be looking good for your booked day then we will contact you in advance and give you the option of moving your trip to another more suitable boat or another day when the weather is looking better. Your experience is the most important to us and we will do everything possible to give you a memorable day out. It was great to be on board this day!! This was an amazing experience and I will never forget it. Thanks again for the pictures…I loved to see the sharks again!!! Regards from Brasil!